Jon David Gruden known as Jon Gruden is an American football coach who serves as the head coach of the Oakland Raiders of the National Football League. He had previously served as the head coach of the Raiders from 1998 to 2001 and Tampa Bay Buccaneers from 2002 to 2008. Gruden even appeared in ESPN to serve as a color analyst on its Monday Night Football telecasts. 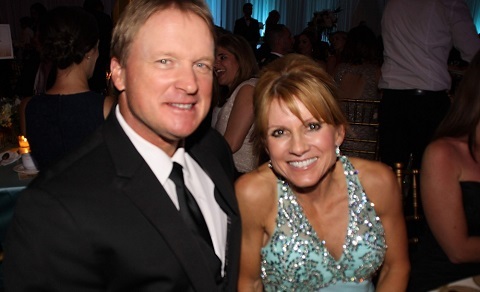 Along with a prosperous career, Gruden has a wealthy private life too. He is married to Cindy Gruden. As of 2018, he has a jaw-dropping net worth of $22.5 million and has an annual salary of $6.5 million. Jon Gruden was born as Jon David Gruden on 17 August 1963, at Sandusky, Ohio, the United States. He was born to Jim Gruden, professional football regional account, running backs coach as well the director of player personnel, and Kathy Gruden. He was not the only child he also has a sibling named Jay Gruden who is also a football coach and a former quarterback. Jon did his high school from Clay High School in South Bend, Indiana. After his high school, he joined Muskingum College in New Concord, Ohio. Later a year, he transferred to the University of Dayton from where he graduated with a degree in Communication in 1986. 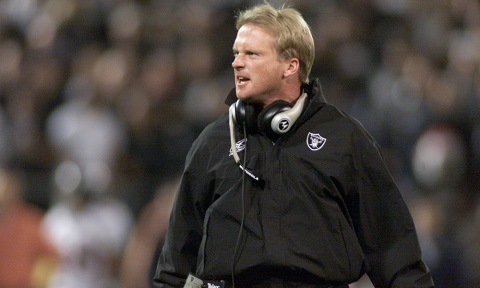 Jon Gruden took his first step in the field of coaching immediately after his graduation from the University of Tennessee as a graduate assistant. Later, he joined Southeast Missouri State as a passing game coordinator. Similarly, he has coached various institutions such as Pacific Tigers of the University of the Pacific, San Francisco 49ers, Pittsburgh Panthers of the University of Pittsburgh, Green Bay Packers, Philadelphia Eagles, Oakland Raiders, Tampa Bay Buccaneers and many more. In 2009, Jon also got associated with ESPN where he served as a color analyst on Monday Night Football telecasts and as an analyst for coverage of postseason college football games. After nine years away from coaching in the NFL, the Raiders announced the return of Gruden as head coach on January 6, 2018. After nine years away from coaching in the NFL. He is often compared with best NFL coaches like Bill Belichick and Wayne Bennett. Moving on to his personal life, he is happily married to his long-time girlfriend Cindy Gruden. The pair first met at the University of Tennessee (UT) where Cindy was a cheerleader and Jon started as the graduate assistant for the university. Slowly their love started to bloom and after a long serious relationship, the couple tied a knot in 1991 where they vowed to be together for the lifetime. Jon and his wife are blessed with three sons named Deuce Gruden, Michael Gruden and Jayson Gruden. There are no any rumors about him having any affairs and relationships other than Cindy. The duo is very blissful with their married life. Jon and his family currently reside in Tampa, Florida. Jon can be seen engaged in various charity works. He has hosted various charity dinner and events. He has started an organization named Fired Football Coaches Association (FFCA). It welcomes the current and former coaches and players to study various phases of games. He has also instructed about coaching in different high schools as a guest speaker. He is a good friend of Peter Sterling. Jon Gruden has an estimated net worth of $22.5 million as of 2018, including all of his properties and earnings. It was reported that Gruden received a yearly salary of $6.5 million for his job as an ESPN color commentator for Monday Night Football. The Raiders announced the return of Gruden as head coach on January 6, 2018. The 10-year, $100 million contract is one of the biggest contracts in the history of the league The ESPN NFL analyst has a height of 5 ft. 10 in. with the weight of 91 kg. To know more about Jon Gruden, he can be followed on different social networking sites like Facebook, Twitter, Instagram, and Wiki. Besides, there are different sites which provide a brief biography of him.